On April 13, 2014, the Intergovernmental Panel on Climate Change (IPCC) released Working Group III’s report on the Mitigation of Climate Change. The report notes that total greenhouse gas (GHG) emissions from 2000 to 2010 were the highest in human history, reaching 49 Gt CO2eq in 2010. Annual GHG emissions grew on average by 1 gigaton of carbon dioxide equivalent (Gt CO2eq) or 2.2 percent per year from 2000 to 2010, a higher rate than at any other period between 1970 to 2010. Economic and population growth continue to be the most important drivers of emissions growth. 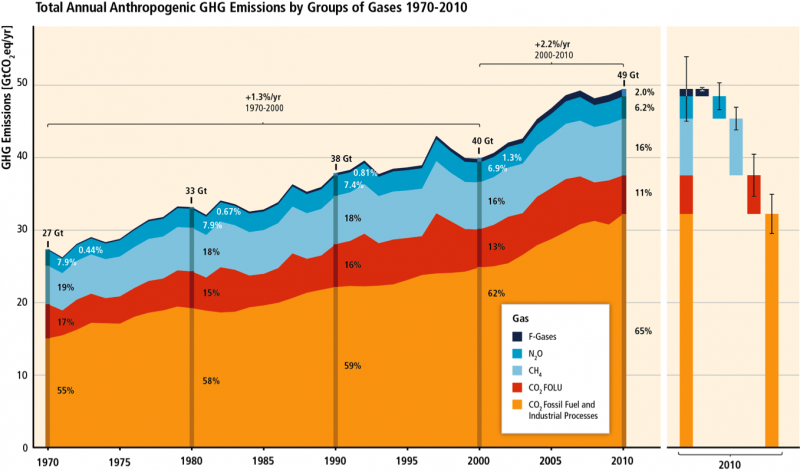 Growth in GHG emissions since 1970, including the period of rapid emissions growth since 2000, have been driven by carbon dioxide emissions from fossil fuel combustion, land use changes, and industrial processes: carbon dioxide from these sources account for about 78 percent of the total GHG emission increase from 1970 to 2010. Carbon dioxide is the major anthropogenic GHG, constituting 76 percent of total 2010 emissions. Methane accounts for 16 percent of emissions (on a CO2eq basis, assuming a 100-year time frame); nitrous oxide accounts for 6.2 percent; and fluorinated gases account for 2 percent. The report lays out a number of “baseline” scenarios (those without additional mitigation actions or policies). These scenarios lead to substantial warming by the end of the 21st century, with global mean surface temperature increases in 2100 from 3.7 to 4.8 degrees C (6.7 to 8.6 degrees F) relative to pre-industrial time. In addition, a number of potential mitigation scenarios are also described. These scenarios explore ways that some of this warming can be avoided, and how decisions in the near-term affect our ability to avoid longer-term warming. To avoid 2 degrees C (3.6 degrees F) of warming relative to pre-industrial time, the report indicates that atmospheric concentrations of GHGs need to be stabilized around 450 ppm CO2-eq or lower. Given that we are currently around 430 CO2-eq, this is a tall order, requiring large-scale changes in energy systems and land use. For example, achieving this level of stabilization will require more rapid improvements in energy efficiency, and a tripling to nearly a quadrupling of the share of zero- and low-carbon energy supply from renewables, nuclear energy and fossil energy with carbon capture and storage, or bioenergy with carbon capture and storage, by the year 2050. As one might expect, the aggregate economic cost of mitigation varies widely, but generally increases based on the stringency of the level of mitigation. In general, the costs of mitigation only offset a relatively small fraction of global projected economic growth for the 21st century. The 2020 individual country-pledged goals (under the Cancún Agreements) are unlikely to put us on a path to avoid 2 degrees C (3.6 degrees F) of warming ; further substantial reductions beyond 2020 would need to be made. Continuing on the pathways consistent with the Cancún pledges is more consistent with scenarios likely to keep temperature change below 3 degrees C relative to pre-industrial levels. If we do not strengthen mitigation efforts between now and 2030, it will be more difficult and more expensive to achieve warming targets, such as avoiding 2 degrees of warming relative to pre-industrial levels. This portion of Figure SPM.4 from the WG III report shows the share of global energy that would need to come from low-carbon sources for four different mitigation scenarios. For all the scenarios, the share of low-carbon energy is relatively large (>70% or higher) at the end of the 21st century. Only the most aggressive scenarios (shown at the right side of the diagram, in dark and light blue) are likely to keep warming below 2 degrees Celsius – these scenarios include rapid growth of low-carbon energy, in which its share exceeds 50% of global energy by 2050.